Most of us enjoy a daily cup (or two, or three) of coffee, but don’t give much thought to where it originally came from or what it can do besides taste delicious. Here are a few facts to enjoy as you sip your coffee today. Coffee is one of the few beverages that have been around for centuries. It was first discovered and used around the thirteenth century. Before people took note of its vitalising properties, it used to grow wildly in the highlands of Ethiopia. There are many myths and legends surrounding its discovery. Some claim that Ethiopian shepherds noticed the peculiar behaviour of their goats upon eating the red coffee berries. The goats became so charged up that they would start jumping up and down. Other legends claim that a traveller from Yemen took note of a bird with an unusual amount of energy. He tried some of the berries for himself, and felt revitalised. Coffee contains caffeine, which stimulates your central nervous system, making you feel alert for long periods of time. Many students drink coffee while studying for a test to make sure they stay up all night. Drinking coffee can assist you to shed some weight. This is due to the fact that it increases your metabolism by up to 13%! Think of it as a complement to your exercise and healthy eating regime that can give your metabolism a boost during the day. Coffee was once thought to dehydrate the body. This is because it contains caffeine, a common diuretic. However, studies have shown that this is not true, unless you drink it in excess and don’t replenish your fluids. You can have too much of a good thing! Coffee can actually make you live a longer, more productive life. 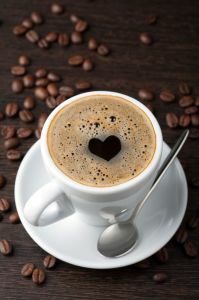 Coffee contains antioxidants, which are substances that fight free radicals in the body, lowering the risk of some diseases such as heart disease and Parkinson’s. Coffee has become part of many lives. Treat yourself to a delicious cup of coffee at our café and enjoy its benefits! Checkout our Cafe Menu.